Opossum fossils have been dated to 70 million years of age, the age of the dinosaurs. Appearance: size of a domestic house cat, with shorter legs and heavier body. The female has an external fur-lined abdominal pouch for carrying young. Adults average about 4 pounds. It has 50 teeth, more than any other Louisiana land mammal. Reproduction: mates in December and January, again in April, and sometime mid-summer. After 12-13 days, 15 or more premature embryos leave the womb and crawl to the pouch. Average litter size in Louisiana is seven. The young are extremely tiny, blind, and incomplete in development. It takes 22- 24 newborns to equal the weight of a penny. The are weaned in 75-80 days. As they grow, they cling to the mother's fur and ride on her back. Food habits: eats anything, including insects, fruits, berries, small mammals, birds, eggs, carrion. It also raids garbage cans. Habits: have an ability to feign death, called "playing possum". This condition is induced by fear and stress. They appear unconscious, the mouth opens slightly, drooling occurs, the entire body becomes limp, and the feet clutch together. 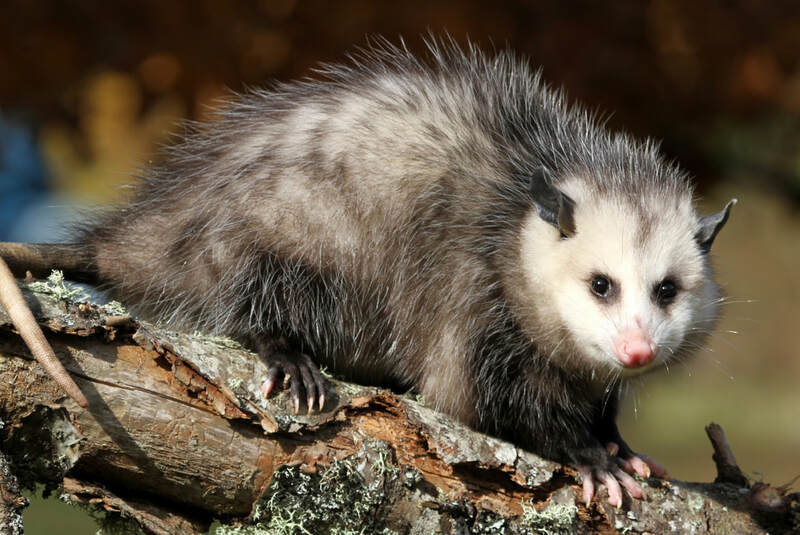 Opossums are clean animals and groom regularly. They do not hibernate. The have a keen sense of smell.